The Mankato City Center Hotel has a rich history in the downtown community and is the perfect choice when visiting Greater Mankato. Our award-winning Mankato hotel and its staff is committed to your total satisfaction. 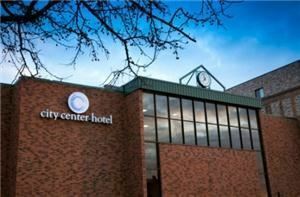 The Mankato City Center Hotel in Downtown Mankato has a large banquet & meeting facility with seating for up to 500 guests. Our hotel also features 10,000 square feet of flexible meeting and exhibit space, with the ability to accommodate up to six separate meeting rooms. Within our Mankato Hotel, guests will find the 101 Main Restaurant, a locally-owned restaurant. Also visit the Blazer Lounge, which offers a full bar with 30 varieties of beer and a fine selection of wines. Our hotel in Mankato has 151 sleeping rooms featuring complimentary high speed Internet. We also offer a business center in the lobby. The indoor recreation area features a large swimming pool, whirlpool and fitness center with a wide variety of exercise equipment. Our convenient hotel location in Mankato is just minutes away from the MN Vikings training camp, Minnesota State University Mankato, Caswell Park, All Seasons Arena, Ridley, Taylor Corporation, Bethany College, ISJ Mayo hospital, Riverhills Mall, & Mount Kato. We also offer complimentary covered parking to hotel guests, and are connected by skyway to the Alltel Center. We are a pet friendly hotel!